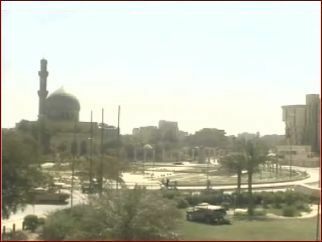 Here's the mosque which has been in the center of the CBS Baghdad webcam's field of view. But where is this mosque? With the daily bombardment of Baghdad why don't we see more pyrotechnics? As interesting as it's been having a realtime view into Baghdad it's been frustrating not knowing more about our perch. Well, here's some minor detective work, some satellite maps, and a pretty good guess at the answer. Although I still don't have the name of the mosque (which would certainly lead to interesting information about it). One of my correspondents asked me to describe my location more precisely. 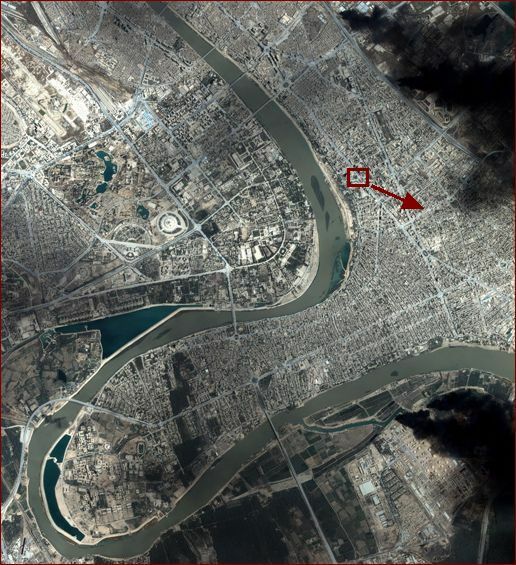 Our hotels are about 4000 meters southeast of the center of Baghdad on the east bank of the Tigris River, about 200 meters from the river. 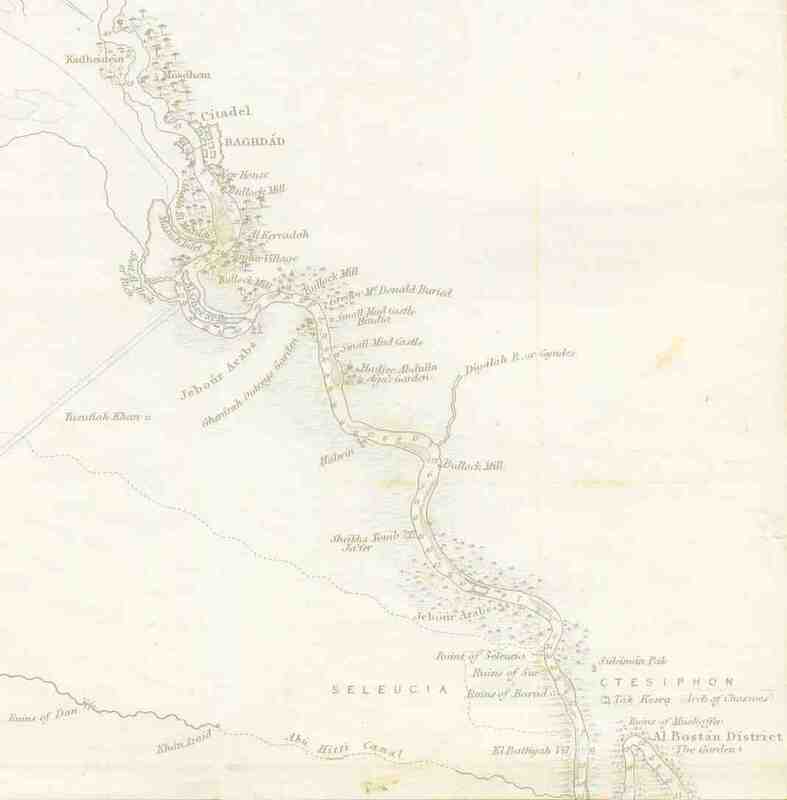 The El Fanar Hotel is on Abu Nuwas Street about 1300 meters south of the Al Jumhuriya Bridge. The Andalus Apartments hotel is about 100 meters around the corner on Palestine Hotel Street. The Palestine Hotel is across the street, and just beyond it is the Sheraton. Here's a full-size view of the roundabout. 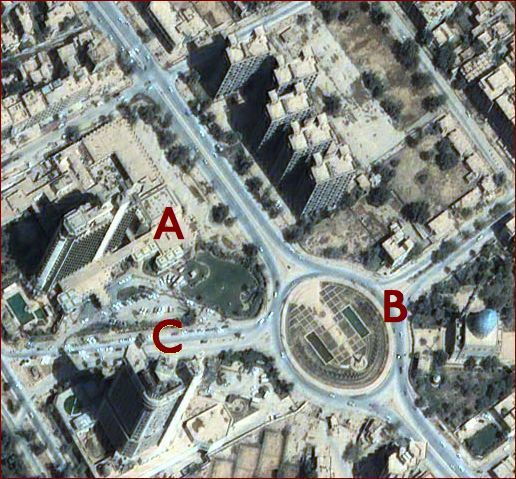 I believe that 'A' marks the site of the camera, which points in the direction of 'B', the mosque. 'C' is the tower which was hit, so that would be the Palestine Hotel. So I'm guessing that 'A' is the Andalus Apartments. I've done some more searching, and have found that an Omar Al Faroukh mosque is on Palestine Street. Perhaps this is our mosque.